I 'm not sure if "Bracketology" is actually a word or not; dictionary.com doesn't list it, although Wikipedia does, defining it as "the process of predicting the field of the NCAA Basketball Tournament." Whatever. 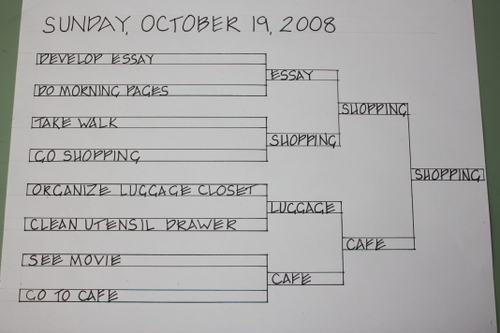 As Mark Reiter and Richard Sandomir note in their book, The Enlightened Bracketologist, you can use the concept to find the "final four of anything,", including but not limited to emoticons, Bob Dylan cover songs, inventions, film deaths, red wines, Yiddish phrases, and marital arguments. For our purposes, we can use it to prioritize the items on our to-do lists, or to figure out what to do when we happen to find a few unscheduled hours at our disposal. Looks like shopping wins! At risk of belaboring the obvious, everyone knows there’s a Container Store in heaven; what I worry about is whether or not there is one in purgatory, you know, just in case. Generally I try to maintain a positive attitude about these things, but it’s important to be practical. If by chance I miss the direct flight to paradise, at least I want to make sure I have access to cedar-scented shoe trees. I may have Supreme Paper Mess, but my shoes are very organized and I want to keep them that way. It’s occurred to me that the difference between heaven and purgatory may not be whether or not there is a Container Store, but what store location the afterlife Container Store is modeled on. I hope the afterlife Container Store is just like the one on North Avenue, with the kitchen supplies to the right and the closet supplies to the left, just like it’s supposed to be. I’ve been to Container Stores in other cities and haven’t been able to find the spice jars or drawer doublers, which is just wrong. Before we bought our place in Chicago, we considered moving to Seattle to be near my family. Had I known at the time that the only Container Store in the entire state of Washington is in Bellevue Square, and that the Bellevue Square Container Store has file boxes where the kitchen supplies are supposed to be, we could have saved a lot of time and anguish. I love my family and I love the Pacific Northwest, but while I’m still living, I’m not ready to trade down my North Avenue Container Store just yet. At least I haven't misplaced a baby in a pile of laundry. Yet.